I’ve always been a fan of thrillers that twist and turn and pull the rug from under your feet. I love dramas that rush headlong and then lurch off in some totally unexpected direction. For a long time, I’ve also been interested in creating a police series. This was something I discussed on and off for a number of years with Simon Heath, Creative Director at World Productions. World have an enviable track record in this area – The Cops and Between the Lines to name but two. We agreed that, in keeping with my medical dramas (Bodies and Cardiac Arrest), whatever we did would have to break the mould. It would have to be full of moral grey areas and populated by antiheroes. My research revealed that modern policing is a far cry from the familiar world of most police dramas. Police procedures have been transformed by a target culture that dictates which crimes get investigated – and which don’t. Forces across the country routinely drop one in three reported crimes to concentrate on cases that can be solved within a workable timeframe by workable manpower. Temporary initiatives prioritise certain offences; once targets are met, these offences are downgraded so resources can be directed towards meeting the next initiative. Meanwhile whole departments are dedicated to monitoring these fluctuating crime figures. These revelations provided the perfect setting for our thriller, the less familiar precinct wherein the police police themselves. Line Of Duty is set in a fictional anticorruption department, AC-12, run by the zealous Superintendent Ted Hastings (Adrian Dunbar). 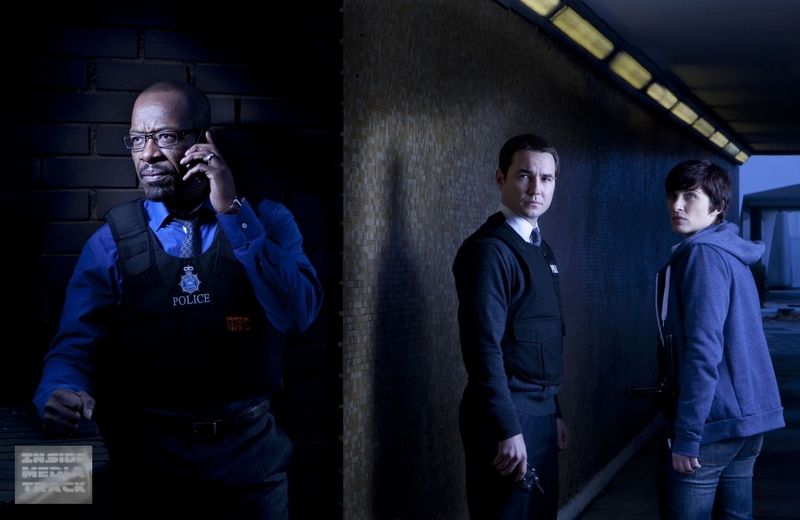 AC-12’s target is the gifted, charismatic Detective Chief Inspector Tony Gates (Lennie James), whose unit returns the best crime figures on the force. Gates appears to be an exemplary police officer, a hard-working family man. But Hastings is convinced Gates’ results are too good to be true. He’s determined to prove that Gates is playing the target culture to advance his own career at the expense of victims of crime. To get his man, Hastings recruits Detective Sergeant Steve Arnott (Martin Compston), veteran of an ill-fated counterterrorism operation. Arnott took an ethical stand against colleagues who wanted to conspire in a cover-up. Ostracised as a result, Arnott is seen by Hastings as the perfect candidate for anticorruption work. Meanwhile, fascinated by Gates but for apparently different reasons, an ambitious young Detective Constable, Kate Fleming (Vicky McClure), inveigles herself onto his unit, teaming up with Gates’ loyal lieutenants, Detective Sergeant Matthew ‘Dot’ Cottan (Craig Parkinson) and Detective Constable Nigel Morton (Neil Morrissey). And, as if being under investigation isn’t enough of a complication for Gates, he’s also trying to hide an affair with an old flame (Gina McKee). Over five hour-long episodes, Arnott, Fleming and Gates become embroiled in a cat-and-mouse thriller. Every time Gates seems cornered, he finds a way to turn the tables. But all the time he’s digging a bigger hole for himself, plunging irrevocably into a moral abyss. And each week the stakes get higher. Soon it isn’t just careers on the line – it’s lives. Line Of Duty is first and foremost a thriller. But it’s also a revisionist commentary on 21st century policing. I have a lot of respect for our police forces. They are generally honest and effective. However, I also think that, as an institution that’s undergone such radical changes in its practices over the last decade, the police shouldn’t be above being examined in a serious, thought-provoking drama. I’m extremely proud of Line Of Duty. It’s beautifully shot by Ruairi O’Brien and brilliantly directed by David Caffrey and Douglas MacKinnon, and the performances are extraordinary. Lennie James has never been better (and that’s saying something). Martin Compston and Vicky McClure are dynamic young leads; as actors they’re mature beyond their years. Gina McKee, Adrian Dunbar, Craig Parkinson, Kate Ashfield (as Mrs. Gates) and Paul Higgins (as Gates’ commanding officer) are riveting; and Neil Morrissey (we called him “TV’s Neil Morrissey”) is an absolute revelation in a role that gets darker by the hour. Line of Duty will air on BBC Two Tuesday June 26 at 9pm.